An earthquake can occur at any moment with little to no warning. But where, how, and why do these frightening phenomena happen? California was once the state with the most earthquakes. Now, however, Oklahoma has stolen this reputation. In 2014, the number and magnitude of earthquakes in Oklahoma increased due to both natural and unnatural causes. Earthquakes form naturally due to movement in the earth’s crust, which is made up of pieces called tectonic plates. The edges of the tectonic plates are called plate boundaries, which are mostly made at fault lines. Earthquakes take place along these boundaries and are set into motion when the edges of these plates get stuck but the rest of the plates are still moving. The energy that would have been used to move the plates against each other is instead stored. Once the force of the moving plate overcomes the friction along the edges, the energy within the land is released in a burst. This energy radiates outward in ripples called seismic waves and makes its way through the Earth’s surface. The waves move through the Earth’s surface, therefore shaking the ground. 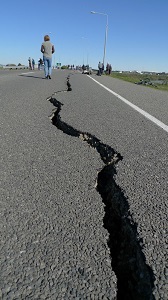 Most Earthquakes are natural occurrences and happen all over the United States. But experts say that Oklahoma’s earthquakes are often different. Here, fracking is a common cause of earthquakes. Fracking is the controversial practice of drilling into rocks to gather their natural gas. The process can be like forcing water into a lidded cup. Increased water deposits cause fluid pressure to rise, thus causing faults to slip. Because of this, Oklahoma’s faults are more prone to quakes than most other places. Earthquakes can be scary. But knowing the science behind this phenomena hopefully makes them seem just a little less mysterious and threatening.